This blog is devoted to music as the essence of life, for music is a path, leading directly to the soundless sound, Aum. We are attuned to music from our earliest life experience in the womb, with the heartbeat of the mother, and other ambient sounds the mother is exposed to during pregnancy. Sound resonance affects us on every level of our body, mind, emotions and soul. In a sense, our journey in life is simply that of seeking to eventually hear and resonate with, the soundless sound. Our bodies are musical instruments, seeking to be tuned to the essential sound-rhythm of the universe. In Japan, each temple has a demon or a lion on either side of the entrance, the guardians of the threshold. The demon on the right has its mouth open, and the demon on the left has its mouth closed. According to Kohrogi Sensei, a Japanese master who I love dearly who is also a great musician, these demons hold great symbolism. The demon on the right has its mouth open, making the sound Ahhh, which is the cry a baby makes at birth. The demon on the left, has its mouth shut, making the sound Mmmm, which is the last sound made, as a person lets go into death. Between these two is life, the resonance, which happens between the polarities of birth and death. A temple offers the opportunity to find the right tuning for life. So the complete sound is: A for birth, U for life and M for death: AUM. As we move on our journey of life, we search and seek for this resonance in myriad ways, and music is a very important Guru on our life path. It supports us in drawing out who we are meant to be. Music can inspire us to dance, cry, to be romantic, to go into wild sexual explorations, to find inner peace, to cathart and let out emotional stagnation, to move into trance states, to embrace angelic dimensions, to be manipulated with, to celebrate with, and everything in-between. When I dance, I offer myself with complete abandon to the music, and become the music, through my dance. I can feel the musicians who played this music; their thoughts and feelings have been downloaded into sound. My dance is the expression of surrender, as happens in love union. For this reason, I am very choosy about the music I listen to. Is this music in service of love and celebration? Is it in service of meditation? Will it bring people together or will it drive them apart? Will it help or hinder the growth of plants? Is it cathartic or creative? In the book, ‘Secrets of the Soil’, the authors give examples of how music powerfully affects plants. If Mozart is played, plants will grow towards the speakers. If hard rock is played, the plants grow in the opposite direction, as if trying to escape. In another book, called ‘Accelerated Learning’, a study is cited, where it was found that the learning of any subject can be greatly accelerated if the person is educated with the opening of all 5 senses, and then lays down for 20 minutes listening to Baroque music. The Baroque music supports the subject being learned to be absorbed into the deeper levels of the brain. Perhaps you may have noticed, that if you have a profound life experience, and a certain piece of music was played at that time, this piece of music will from then onwards be associated with that particular experience. That is why people get hooked with the music they were exposed to at adolescence. This time of life is such a powerful transition, physically, mentally and emotionally, and the music serves as a threshold of initiation, imprinted for life. When I went to swim with dolphins, the guides would take the boat two hours out into the deep ocean. Then they would play the music of Deva Premal and Miten, or some exquisite flute music, and wild dolphins would swim towards the boat from out of nowhere. It was obvious they were being called by the music. I have a vision, which I hope will manifest on the physical plane: an Eco Village, with a sound temple in the centre. I love the traditional Indian Sound Temple, which is part underground and partly above ground. One has to bow down to enter. Inside, there is a domed roof, perfectly shaped for maximum sound resonance. If you chant AUM in such a space, it will cascade back over you at least 10 times. I have chanted AUM in a sound temple, and after a while I felt like I was in an ocean of AUM. Imagine if, in this mystical village I am envisioning, that whenever a person feels out of synch, or out of tune within himself or herself, he or she can go into the sound temple, and get tuned to the cosmic rhythm. A wonderful self-regulating system for mental, emotional and spiritual health! In addition to this, gatherings of people who sing together, or dance together, with live music, keeps the community in a vibrant state of life affirmation. Any community worth its salt needs to have regular live music events. This is one of the reasons I have been going to Corfu for the last 20 years. There are so many live music events there! 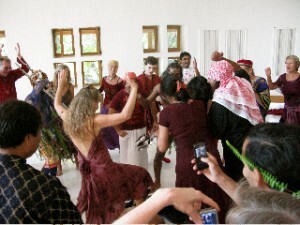 My friend Shivananda offers Heart Dance, which involves singing sacred songs and creating interactive dances with the songs. 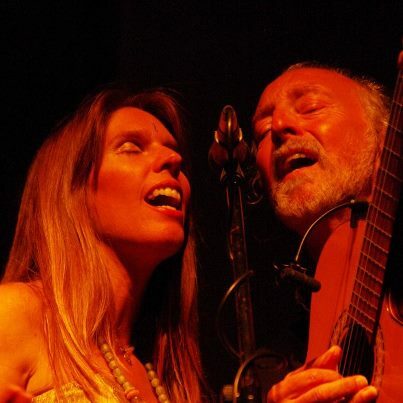 Anadi and Shivananda, also offer the Singing Sangha held in Alexis Zorba. These are gatherings for singing devotional songs from India or from the Sufi Tradition. There are a variety of musicians who take turns playing each Saturday evening, for an Osho meditation with sound and silence, which also includes his inspiring discourse. This is held in Corfu Buddha Hall, a magnificent meditation space high up on a hill. Satyaa and Pari, also from Alexis Zorbas, hold regular evenings of devotional singing. I also experienced them in concert, in the Festi Spirit in France. Luckily this concert was held in the open air, otherwise it would have blown the roof off any building! Such power and energy of celebration was released that night! 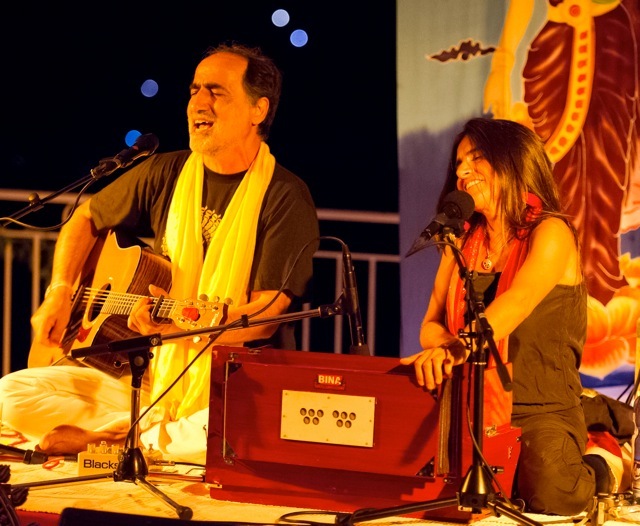 Pari was rapping and singing, offering spiritual wisdom with a vibrant musical accompaniment while Satyaa’s ecstatic voice floated over the top, swirling us up to the stars. In the same festival, (don’t miss it next year!) we had the honour of hearing Prem Joshua and band in concert. He is a superstar in India, and perhaps it will not be so log before he is recognized as one in the West. His music has reached to the status I could call perfection. Each note, flies like an arrow directly to the centre of being. I suppose everyone in the world of personal development has heard of Deva Premal, Miten and Manose. Their music has enchanted the likes of the Dali Lama and Ekhart Tolle. They offer music and singing groups in the Corfu Buddha Hall with 150 people in attendance each time. I am sure the whole planet benefits each time they play, even though this is not heard by all physical ears. I simply adore the music of Praful and Peruquois, both master musicians. Sometimes they play together, which is simply ecstasy to be present at. In the Tantra Festival in France, I had the great pleasure of hearing Praful in a solo concert. He was awesome! His humility, sweetness and phenomenal talent are woven together in a way which cannot be forgotten. Bhakta, a musician friend, has created the music for two of my CDs. He is not easy to find on the web, but his music is exceptional. When choosing music for meditation, a necessary requirement is that it does not go out of date with the passage of time. Such music needs to be tuned to the human heart and soul, rather than what is fashionable in the moment. Bhakta achieves this effortlessly, because he is such a deep meditator. If you have ever been to Osho Leela, you would no doubt have heard the music of Presence, a very talented group of musicians who have created the music for my Mahamudra CD. Their amazing attunement together has happened by playing music for meditation and celebration for decades. I was divinely spoiled for many years, hearing many of the above-mentioned musicians, (and many more) playing for Osho. In his community, each time he entered in the Buddha Hall, we had incredible music, which carried the ambiance of ecstasy, devotion and meditation. 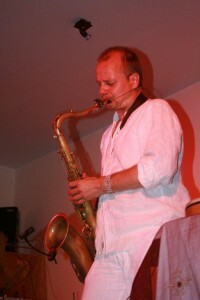 It is not a surprise that many of those musicians who played for him, went on to become renowned in the world at large. A lot of the music coming from the world of Osho, is played on Radio Magico, an online radio you can tune into 24 hours a day! With this blog, I offer tribute to the many musicians I know, and also to those I don’t know but whose music I love. There are so many! 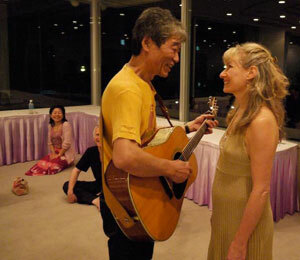 In Osho’s community, we had live music not only when he was physically present, but also enjoyed Music Group, where we sang and danced to abandon. And if someone died, Osho instructed us to hold a Death Celebration for the person, giving them a good send off with all their favourite songs. We would accompany them to the Burning Ghat, singing and dancing all the way, and then sing and dance around their funeral pyre as their body was burning. What a way to go! Music, singing and dance as a way of life and death, has been integral to many indigenous people. A tribe in Africa, has a tradition which I find very beautiful. When the child is in the womb, the mother hears its soul song. As the child is being born, this song is sung. When the child grows up and gets married, the song is sung. At each important transitional point in the life of this person, the song is sung. And as they leave the world in death, their song is sung. What a beautiful tuning this person must feel with the heartbeat of the universe! In this blog, I am focusing on live music. However, I should not neglect the world of recorded music. How fortunate we are that this possibility exists! We can dance all night and the musicians who are being heard, are not getting tired. It makes such a difference in groups to have exactly the right piece of music to go with a particular exercise or meditation. I am very lucky to work with co-teachers who are expert in the art of DJing…. I propose a toast, to music, to musicians, and to those who dance and sing to music. Life is beautiful and joyful because you are here among us. We find our path through the heart, because you sing, because you play your instruments. Your creativity awakens us to our potential to be co-creators with the divine. And as we drink the wine of life, a song is born, a song of celebration, a song of deepest gratitude. Hear and read more about some of the amazing musicians Sarita knows with our In Profile on Mystical, Magical Musicians!